This is my favourite plugin. I had a textarea containing the code for a flash object for people to copy into their pages and wordpress fucked up my code and gave people avery long code that didn’t work. Thanks for you comment! I’m very pleased you liked the plugin! I had a very similar problem and couldn’t understand why no one had done something like this. Unfortunally on my theme “deluxe theme” not working ? BTW, are you using qTranslate? 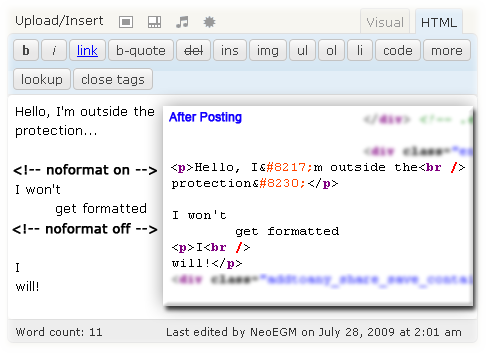 It has a bug which formats your code in the editor when saving your posts (take a look at http://www.qianqin.de/qtranslate/forum/viewtopic.php?f=3&t=821). I installed your plugin to solve a problem with a particular post. When I look at the information saved to the database, it looks all right. But then in the page source, blam! br tags everywhere (and the “noformat on” comment stripped out). I’m not using qTranslate, so that easy answer is out. By the way, have you ever installed any similar plugin to the WP-No-Format? If it’s possible, could you send me the list of plugins you’re using? I’ll see how we can solve this! I just sent the data, then realized I needed to send you a list of my plugins. At the top of the list was Advanced Fancybox, a lightbox photo gallery plugin. “I never use that,” I thought, and disabled it. Hey, presto! The evil line breaks disappeared. A lucky accident has saved us some work! I love when that happens. Thanks for your swift response, but I now think the problem lies with them. It seems an odd thing for a lightbox plugin to be messing with, but there you have it. I was just about to test what you sent me and got your comment! I’m very glad you solved your problem! I’m here for any further comment, problem or suggestion you may have! I am trying to get this code in, but no luck. It does not show up when I access the web page. Does this only work for posts or every HTML editor (i.e. Pages) in WP? Any ideas? Hi I have was setting up a website and I was using your no format plugin. Everything was going fine but now when I switch between visual and html, Im losing my page breaks Have you any other reports of this. I am not using any special code just divs and styles. The WP-No-Format plugin does not touch the page breaks at all while editting the posts/pages. It just ensures they won’t get removed when you visualize them, if you put the corresponging “noformat” tags. On the other hand, the Visual editor is not made for working with HTML mode. It does not really work well while switching between modes and lots of plugins make it break your code completely (for example, the qTranslate plugin toches the line breaks while switching between languages). If you want have control of your code, I’d recommend you to either disable the WYSIWYG editor or, if you can’t do that (for example, if you use qTranslate), at least, hide its tab. If you need further information, just tell me. I am trying to use your plug-in so that I can put MAP data in my posts. WordPress auto adds to all my areas so it screws it up. It still does that after using your plug-in. Have you added the <!-- noformat on --> and <!-- noformat off --> tags surrounding your code in the HTML mode? If you have done it and it still doesn’t work, send me a list of your enabled plugins and the exact code you’re trying to post via the Contact form. What are you having problems with? With the re-formatting of the HTML code while editing posts or with the reformatting while displaying? Man, I love a plugin that is simple and direct and does one thing well, like yours. I have a request for a (hopefully) simple addition. It starts with a wordpress bug (http://core.trac.wordpress.org/ticket/2691) that is putting incorrect formatting around HTML comments. I am using a plugin that adds stuff at the end of every post, and they conscientiously bracket their added stuff with comments, which then become paragraphicated. Would it be possible for you to add a feature (or create a separate plugin) that would block automatic formatting of all content added by other plugins? It would essentially add a marker immediately following the post, before other plugins add their stuff (like social bookmark plugins, for instance). What a great and useful plugin! Going to apply it to several of the blogs I work on right now. I’ve seen other plugins out there that remove all auto formatting, but you can’t pick and choose from where, which is all I want. Thank you!! By the way, I notice that you have customized your commens so that your own comments appear differently. I’ve found numerous plugins that enable me to do that, but none that work alongside with comment reply. I see that you have successfully achieved this. Did you use a plugin? May I ask what plugin? It looks great! Hey, nice idea, I tried it on WP vers 3.0 but it doesn’t work. The no format tags get wrapped in a tag and the code between dissappears. Will you be updating it? I would be happy to pay for something this good if it works around this rotten problem! I’ll try to fix it soon! Thanks! I’ll do it soon! I have tried adding all code to the donation page. I couldn’t find any information on whether this plugin supports php5. I was planning on upgrading my server to php5 from php4 but didn’t want to break my site without checking. Thanks in advance. With this code, all i would have to do is inserting images in my WYSIWYG to create a pretty slideshow…if only auto tags were disabled for this particular bloc! Thanks to your plugin, now it works! Hello. I know these posts are old, but is this working for the latest version of WP? Also, can it work on just one page?